We’ve all seen some tutorials with outrageous designs where it shows you just how to do a small part of the technique. In this article, we’ll start from scratch with a basic photo and create a fully realized design—in no time at all. As mentioned above, it all starts with a photo. 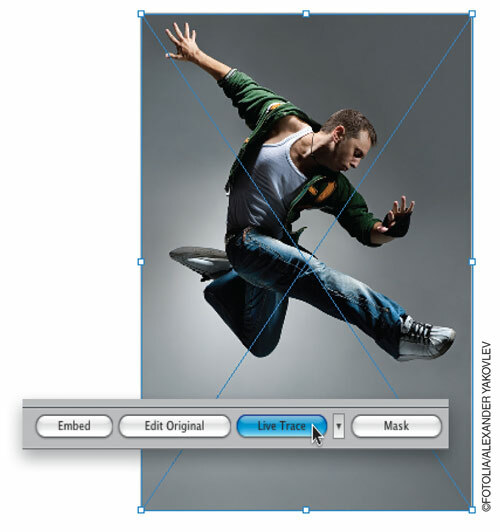 We’ve placed (File>Place) our photo of a dancer into a new Illustrator document. We just want to make this a simple black-and-white graphic, so with the photo selected, click the Live Trace button in the Control panel to invoke the default settings. Depending on your photo, the graphic may need some tweaking. In the Control panel, locate the Threshold field, click the arrow to its right, and adjust the slider to increase or decrease the setting. You’ll see the graphic change as you do this. Find the setting that makes the graphic the most appealing. For our image, we used a setting of 83. We want to edit the vector object itself but, because the graphic has been traced, we’ll have to expand the shape from a Live Trace Object to a standard object, so click the Expand button in the Control panel. Sometimes the graphic will be grouped by default: Simply go under the Object menu and choose Ungroup. Now we’re done with our main graphic, so let’s add some elements to jazz it up. Open the Symbols panel (Window>Symbols), click on the flyout menu (top right), and choose Open Symbol Library>Dot Pattern Vector Pack. 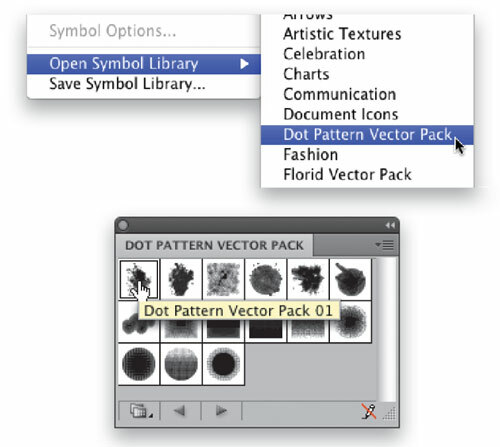 Select the first Dot Pattern named Dot Pattern Vector Pack 01 and drag it into the artboard. Go into the Symbols panel flyout menu again and this time, choose Open Symbol Library>Grime Vector Pack. 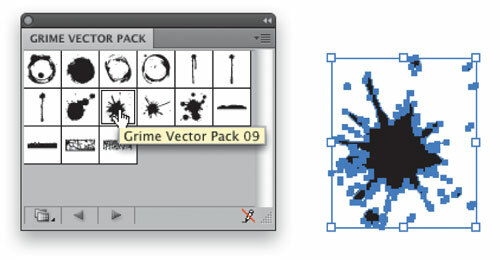 In this panel, click on the Grime Vector Pack 09 symbol and drag it to the artboard. As we did in Step 6, click the Break Link button to make this an editable vector shape. In the Swatches panel, we chose the blue swatch (C:70, M:15, Y:0, K:0) to fill the grime shape and add to the “edginess” of the design. 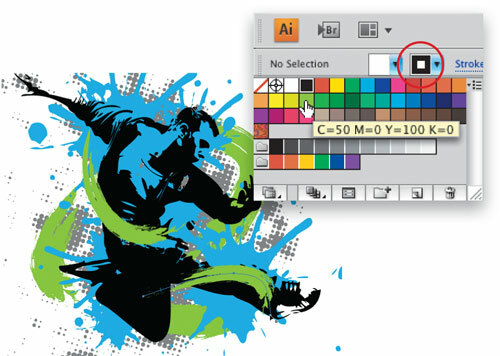 Of course, you should try playing with other colors to change up the feel of your graphic. Place this shape over the working design. 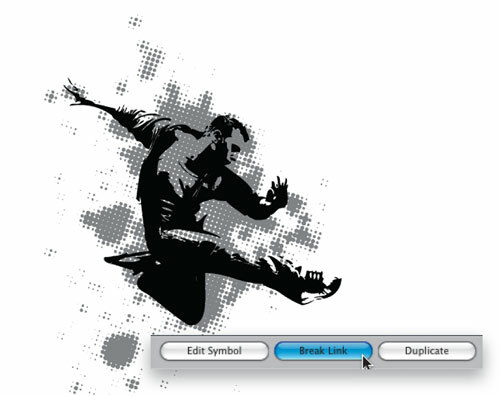 Then, while holding down the Option (PC: Alt) key, click-and-drag the shape to create duplicates, and position these duplicate shapes so that they somewhat cover the traced figure. Vary these shapes by rotating and scaling them so the overall shape is more appealing (as shown). 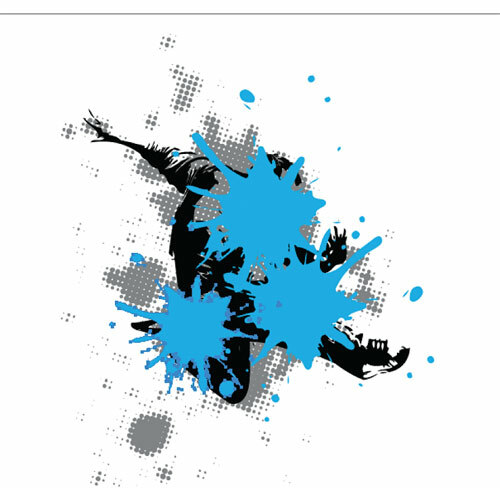 These grime shapes need to be behind the traced shape but in front of the dot graphic. 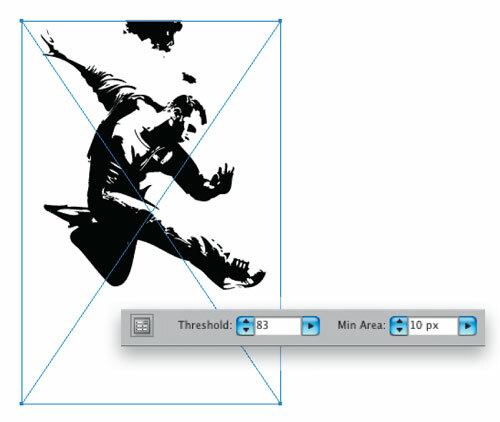 Select the traced shape, go under the Object menu, and choose Arrange>Bring to Front. 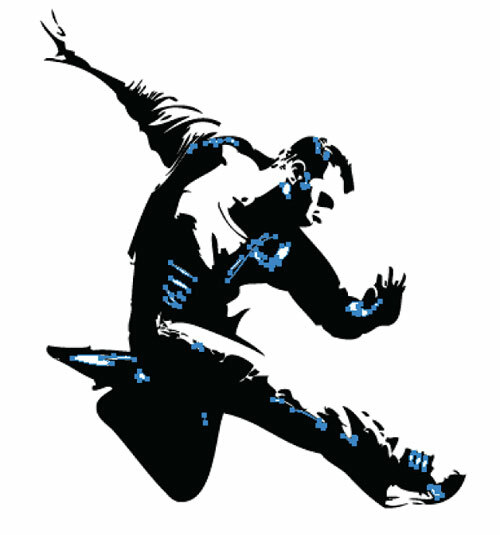 If needed, reposition the blue shapes to reveal certain parts of the figure. Now open the Brushes panel (Window>Brushes). 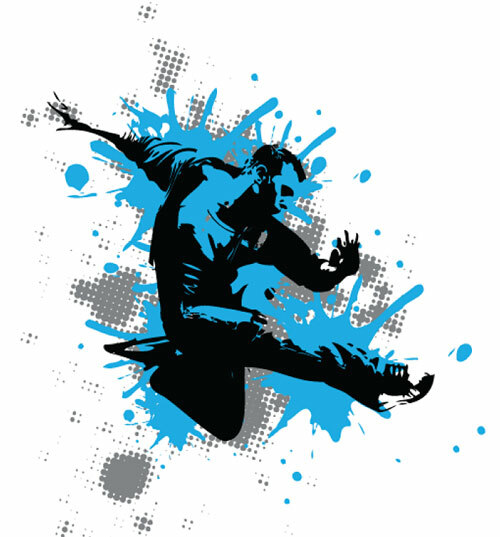 In the Brushes panel’s flyout menu, go to Open Brush Library, then Vector Packs, and select Grunge Brushes Vector Pack. 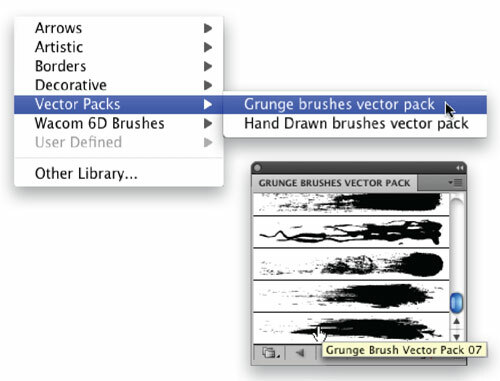 Click on the Grunge Brush Vector Pack 07, then choose the Paintbrush tool (B) from the Toolbox. In the Control panel, click on the Stroke icon (second from left), then click on the green swatch (C:50, M:0, Y:100, K:0) to set your stroke to that color. 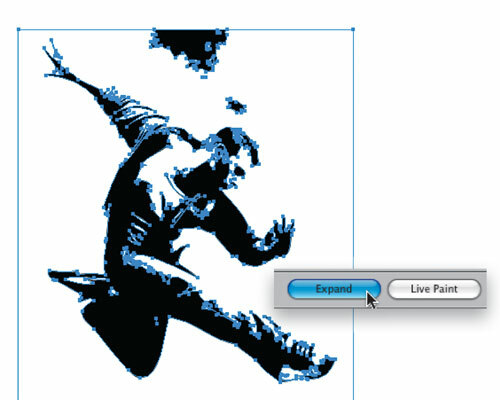 Now, using the brush we selected in Step 11, paint random strokes around the subject, as you see here. If the stroke seems too small, just double-click the brush in the Brushes panel to open the Art Brush Options dialog, and enter a new percentage for Width. Vary the illusion of depth by sending some of the strokes behind the other shapes. That pretty much does it. All that’s left is to add some text (we found a cool grunge font over at www.daFont.com) in a color from the overall design, and there you have it. You’re right, we did mean “flair.” We’ve already made the change. I was not able to locate the same photo at Fotolia; I took another one but the result is not convincing. The same apply for many tutotials. great tutorial. thanks, this helped me tap into the abstract side of illustrator! That was really great, although my brother and i were both looking at it, and he is not so into the excessive grunge look. How can i get these vector packs? Thx Cool work! it will work for me as well! Awesome tutorial! 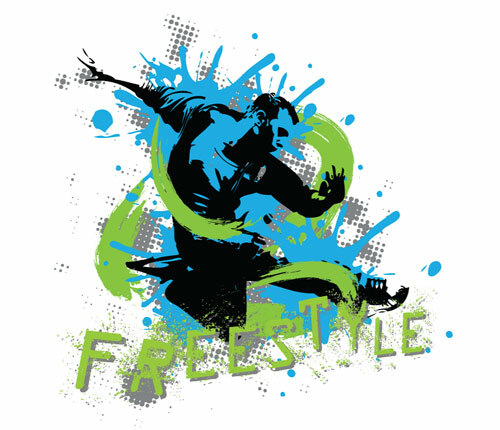 I am using CS3, and the vector packs are not available in my symbol library – where can I find something similar? The tutorial is verry good (read awesome [for those sho couldn’t get it, sorry but you need to be creative and play with different numbers, don’t get stick by the book]). Dear Layers Magazine (all of you the good guys), thanks for all your effort, and good work. it’s very clear and step by step details, that what i need. thanks and wish having more illustrator demos more often. I’m kind of with the folks who can’t access the vector packs; if you’re going to demonstrate something that only works in a particular version of the software (i.e. CS4), you should say so up front. Other than that, I was WAY cool with it. 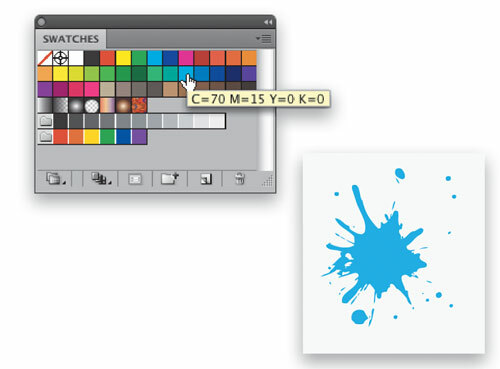 We’ve added a mini-tutorial showing how to fake the Dot Pattern Vector Pack 01 symbol if you don’t have Illustrator CS4. Thanks, this really helped. I don’t know how to save my vector so I can upload it to Myspace though. Thank you, that was very helpful. Not only a great tutorial from a learning the basics point of view, but actually a pretty sweet effect too. This is a great tutorial to take anyone from elementary illustrator work, to intermediate. Very easy to do and very helpful. Thank You!! !